i. Sketch the graph of the curve , for . The straight line , where is a constant, passes through the maximum point of this curve for . ii. Find the value of k in terms of . iii. State the coordinates of the other point, apart from the origin, where the line and the curve intersect. 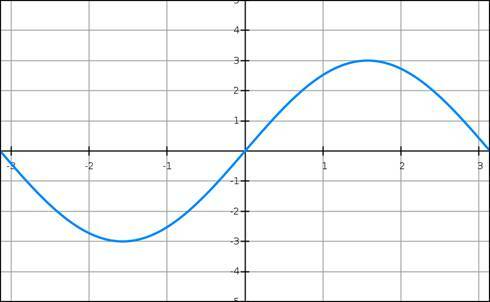 We can sketch the graph of , for as follows by utilizing odd property of sine function. We can find the points of the graph as follows. 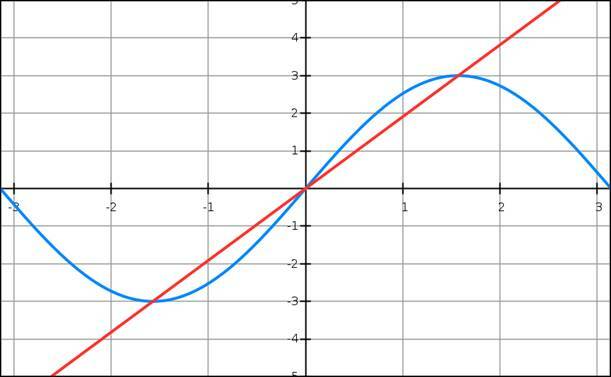 We are given that straight line with equation passes through the maximum point of the curve given in (i). It is evident from (i) that maximum point of the given curve has coordinates . Since straight line with equation passes through point , coordinates of this point must satisfy the equation of the line. Since we are required to state the coordinates of the other point, apart from the origin, where the line and the curve intersect, it is evident that we will not do tedious calculations and would only utilize what we already know about the curve and the line. We know the coordinates of a couple of other points on the curve and hence can see which of those satisfies the equation of the line and that will be our desired point. After getting the maximum point of curve as point of intersection of curve and the line, the other obvious choice will be to test coordinates of minimum point of the curve . We have got the same value of as in case of coordinates of maximum point of curve. Since coordinates of minimum point of curve also satisfies the equation of line, it must be point of intersection of curve and the line.